Here at WeAllSew.com we love to share ways to use your sewing and crafting talents to help those in need. This November 23rd we invite you to join us in celebrating National Tie One On Day by donating a handmade apron and a baked goody to someone in need while pausing to reflect on giving thanks for the holidays. Of course we’ll share some great free tutorials and patterns for aprons, too! Tie One On Day was started by EllynAnne Geisel, who became enthralled with aprons while writing an article about them back in 1999. Since that time, EllynAnne has collected hundreds of aprons, apron memories and stories from all across the Nation. EllynAnne believes that this event can help us all to “Put the give back in Thanksgiving” with the power of apron love! Thanksgiving has traditionally been a time to give thanks and enjoy the harvest, and has also come to be a holiday of sharing with family and friends. Tie One On Day is an opportunity to share some of your good fortune and bountiful harvest with someone in need; it could be a neighbor, family member or friend that may need a little help, or someone in your community that is hungry or homeless. This year on November 23rd as you are preparing for Thanksgiving, take a break to reflect on your own good fortune and give thanks, then pass it on. Take a loaf of bread or other baked good and wrap it up in an apron (and you may even want to include a note of encouragement in the apron pocket), to deliver it to someone in need. If you can’t think of anyone who would benefit from the apron bundle, check to see if there are any organizations in your community who could use the donation to help others (a local church that passes on donations, a community food pantry, or a shelter). Visit the official web page for National Tie One On Day to get in on a goodie giveaway, a free Tie One On Day notecard download, and to find out more about the event. Be sure to stop by this page to grab one of the National Tie One On buttons or badges to share on your blog or web page. And now we challenge YOU to stitch up an apron and join in on National Tie One On Day! 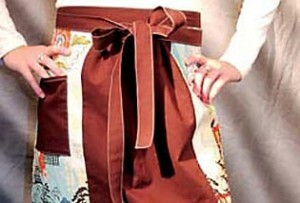 Aprons are easy to make, often using a yard or less of fabric. Here are some of our favorite apron tutorials and patters PERFECT for whipping up one to share! The Two Tone Apron by Kathryn Goodman. The next time you’ve got something yummy to make, sport this charming two-tone apron and the compliments won’t be far behind. It’s easy to create, and a lot of fun to wear. Download PDF instructions for the Two Tone Apron. The Floralicious Fan Apron by Susan Beck. 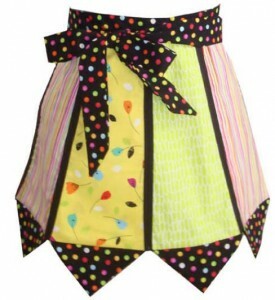 This fun apron is easy to make using bright and cheery coordinating fabrics. Download the PDF instructions for the Floralicious Fan Apron. The BBQ Apron by Stacy Schlyer. Don’t let the guys feel left out in the cold, men can take the heat in the kitchen, too! 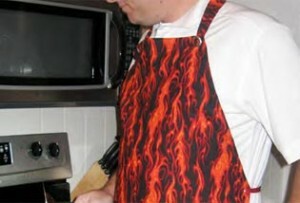 Stitch up a men’s apron with these PDF instructions for a BBQ Apron. An apron with vintage flair! 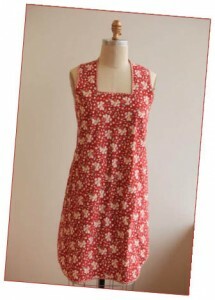 If you like vintage charm, try The Slip Over Apron, a vintage pattern from our “Sewlebrity” Amy Barickman. This is a project from the book, Amy Barickman’s Vintage Notions: An Inspirational Guide to Needlework, Cooking, Sewing, Fashion and Fun. Download the PDF patter for The Slip Over Apron.